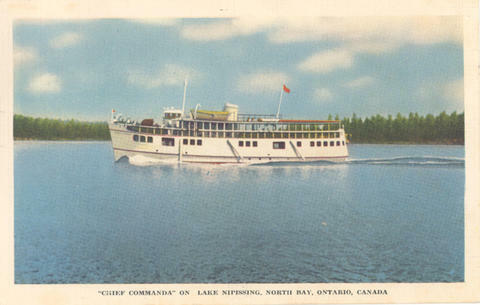 Item 074 - "Chief Commanda" on Lake Nipissing, North Bay, Ontario, Canada. Published by Jack H. Bain, Toronto, Canada. Card was cancelled at North Bay, Ontario, 6 July 1953. Card is addressed to: Mr. C. K. Carothers. 510 - 28th Ave. Altoona, Penna. U.S.A. Message reads: Hi Charlie. This is my boat, but you know I have no line. Had a real nice trip up, but no fish so far. Porter.